Overhead conditions today were very pleasant - fairly mild and sunny. Underfoot, however, running conditions were certainly tough with enough slidey mud to keep even the most avid of mudlarks happy. Just six personal bests were achieved today among the 246 parkrunners. * the mini roller coaster section when the path leaves the Victoria Cross Grove area before passing through into the events field. I found that fairly manageable by keeping well to the left where the path, although very muddy, is less tilted at a slidey sort of angle! Today's faceplant potential 3.5/10. Of course, the simplest way to reduce such scores to about 1/10 is to slow right down at the critical parts of the course - and, judging by the low number of PBs, that's probably what many parkrunners did today! To my mind this illustrates why it was sensible to skip having a December pacer day and to keep that situation under review for the next month or two. A Happy Christmas to ALL our volunteers and parkrunners. Here's what we've got lined up for you over the next couple of months or so at RTW parkrun. Our usual Saturday parkruns continue through the winter. If there's snow and (especially) ice around do keep an eye on our website and social media (Twitter or Facebook) for news of course inspections and possible weather related cancellations. 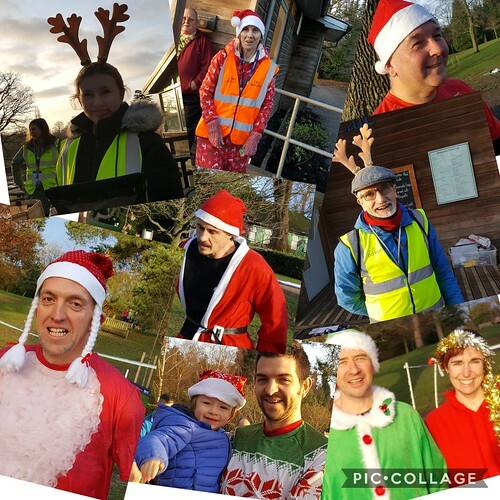 Christmas Day We have an extra parkrun (Yay!) laid on for you this Christmas Day. It will be at the usual time of 09:00. Many thanks to all those who've already volunteered. It would be great to enter the festive spirit with an outbreak of santa hats, antlers and such like. Remember to give a massive thank you to all the volunteers on the day! Saturday 19 January - RTW parkrun New Year social It would be great to make a New Year resolution of getting to know other parkrunners and volunteers that bit better. We'll be holding an evening get-togther at 20:00 in The Guinea on Calverley Road – an area has been reserved to the side of the bar. Saturday 16 February - our Valentine themed parkrun. Bring a loved one along and it'll be a red themed parkrun. Pacer days: due to the current gloopy and rather slippery condition of the course we've decided not to hold a pacer day in December. We reckon that when conditions are really squelchy the majority of parkrunners are probably just concentrating on getting round the course in reasonable shape rather than looking to achieve a target time. We may potentially hold pacer days on 26 January and 23 February, but we'll keep an eye on course conditions and aim to let you know in good time whether we're going ahead with these.